An impromptu hot pot at home tonight resulted in the need to do a bit of shopping today. Usually, T&T serves as the one-stop destination for hot pot related products. However, as most of us know, it is definitely not the best value. Case in point, the sliced beef for hot pot is so overpriced, it costs more than a prime rib roast if you calculate on a per pound basis. Thus, I never buy hot pot beef at T&T. I find the best place to get quality beef for a reasonable price is Hankook Meats on Kingsway which can be found in the same complex as Samosa Garden. Since we had not eaten lunch yet, we thought of places to go near H ankook Meats. One place that came to mind was Vanya. Viv swears that we've been here before; but some reason or another I don't remember it. 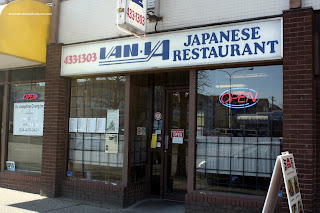 Prior to it changing hands, the place was Japanese-run. Now, apparently it's not. However, the sushi chef and staff are all Japanese (information provided by several readers). Suffice to say, there is absolutely no parking in the Collingwood area during the daytime, especially on the weekend. Despite the sign not indicating so, the adjacent parking lot does have spaces reserved for Vanya. Now, if you were expecting a modern, fancy Japanese restaurant, stop reading now. Vanya is definitely ol' skool in the same vain as Koko. However, the restaurant decor, carpet and furniture has seen it's best days. A good candidate for restaurant makeover. For me, I don't really care about decor, as long as the food is good. We decided to order everything a la carte and started with the Assorted Sashimi. At $11.00, the portion size was quite underwhelming. But the quality of the product made up for it. Viv was quite impressed with the wild salmon a nd tai. They were both fresh and delicious. 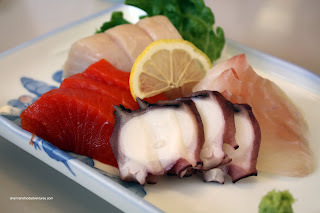 I liked the tako since it was the perfect texture of slightly chewy while not too chewy. Although the tuna tasted fine, we thought it was a bit mushy. Not knowing what to expect, we got the Seafood Salad. It turns out that shrimp and imitation crab stick accounted for all of the seafood. 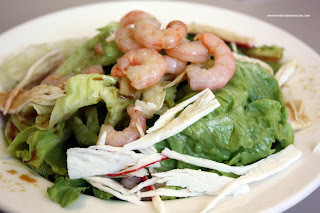 With large uncut leaves of crispy lettuce, the salad was pleasant to eat, if not a bit boring. The copious amount of vinaigrette was a tad on the salty side. Originally, I was tempted to order the Futomaki for $9.00; rather, we inquired about the Vanya Roll. Turns out for $8.00, it is the seafood equivalent of a Futomaki. 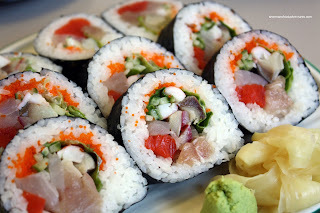 Consisting of wild salmon, tuna, tai, hokkigai, ebi, mackerel and imitation crab, this was a really large roll. And with 9 pieces, we thought this was a great value. Great value aside, the roll was delicious as well with many different flavours and textures at work. The sushi rice was a tad dry; yet it still had a good chewy consistency. Often, when we order gyoza, it is not fried up properly (due to lazy kitchen staff). Well, I have to say that the gyozas were nicely browned. The soft, thin dumpling skin encapsulated a fluffy meat and veggie filling. 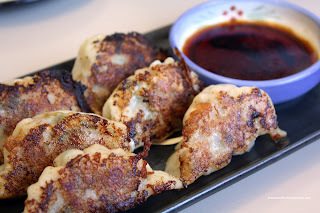 Really good gyozas. We got 2 items specifically for the kiddies (which we end up eating if they don't...). The first was the Oyako Don. 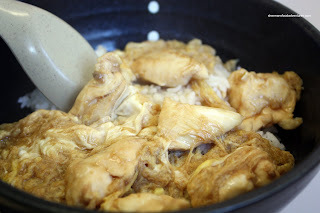 They used white meat in this particular case and to our surprise, it was tender and juicy. Mixed with fluffy egg and just the right amount of mirin/soy/dashi mixture penetrating the rice without making it salty. 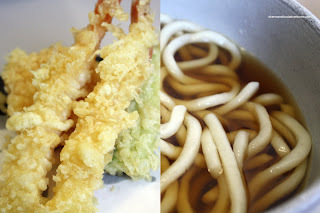 As expected, we got the Tempura Udon again. Hey, my son likes udon and tempura (only the batter though!). The udon was alright, the noodles were a bit soft while the soup was pretty flavourful. I wasn't a huge fan of the tempura though. The batter was a tad thick and had a layer of sogginess beneath the crispy outer coating. Although not perfect, the meal at Vanya was satisfying. Definitely reminds me of the style you'd find at Hi-Genki and Koko. Not modern Japanese food; but good home-style Japanese food. Nothing wrong with that. This is my favourite place for teishoku (japanese home style bbq fish sets). I haven't tried their sushi yet, but it looks promising. I like the old school feel of this place as it reminds me of the japanese movies/shows I've watched about authentic homey diners/cafes. I thought everyone was japanese until the manager/host started speaking mandarin. But still, it has a very homey feel and the food is prepared with care. I second Holly's opinion about the dishes in Vanya. While sushi could be good, its mainly a set menu type restaurant. hey, lemon! why don't more places give you a piece of lemon with sashimi? it goes so well, especially with salmon. i like that they don't use that pink ginger either... what's the difference, anyway? i always find the lighter coloured stuff tastes a lot better. Holly, I believe that the original owners sold the place. But I still think it's Japanese-operated. Kim, I guess the set menus didn't appeal to me, so I went a la carte. Didn't matter anyways, I generally enjoyed the food. Trisha, I agree. I like lemon with my sushi too. In terms of the ginger, I believe it is merely food colouring and maybe the age of the ginger itself. But I'm not completely sure. If you look @foodinspectionweb, the ownership is no longer Japanese. Once again, thanks for the information. That helps a lot. Changes have been made to the post.